What is the difference between a liquidity issue and solvency issue? A liquidity issue (crisis) occurs when a firm (or country) has a temporary cash flow problem. Its assets are greater than its debts, but some assets are illiquid (e.g. it takes a long time to sell a house. A bank can’t suddenly demand a mortgage loan back) Therefore, although in theory assets are greater than debts, it can’t meet its current payment requirements. A solvency crisis occurs when a country has debts that it can’t meet through its assets. i.e. even if it could sell all its assets, it would still be unable to repay its debts. To be insolvent is much more serious because even if you have access to temporary funds it can’t solve the underlying problem of excess debts. When Lehman Brothers went under, its debts (liabilities) were much greater than its assets. Therefore, even though it had access to temporary funds from the Federal Reserve, this access to liquidity couldn’t solve the underlying problem that it couldn’t meet its liabilities. 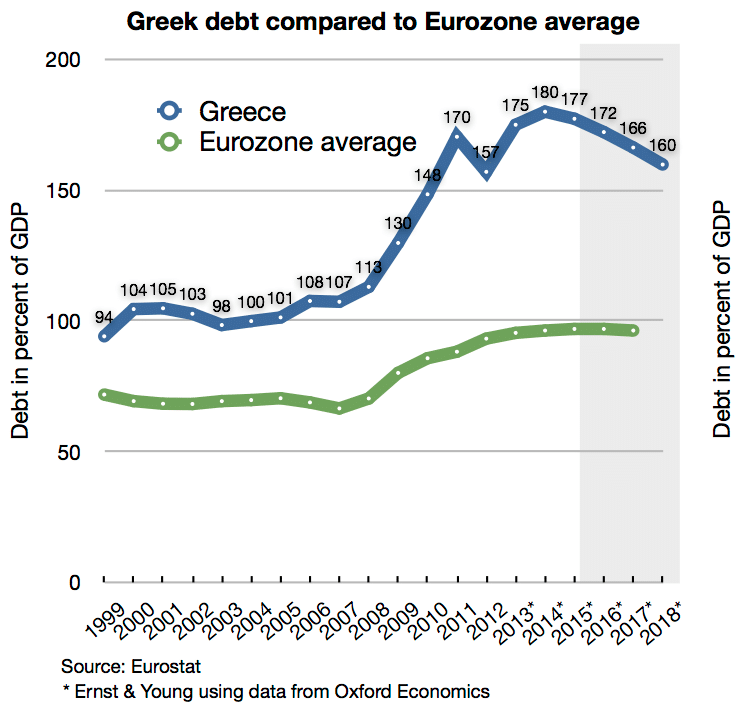 Arguably, the debt Greece faces means that it is insolvent. It’s debt to GDP is so large that there is little chance Greece could pay off its debts from current tax revenue. Therefore, it will have to default on at least part of its debt and receive bailout funds. Another example could be a country which faces a liquidity crisis. 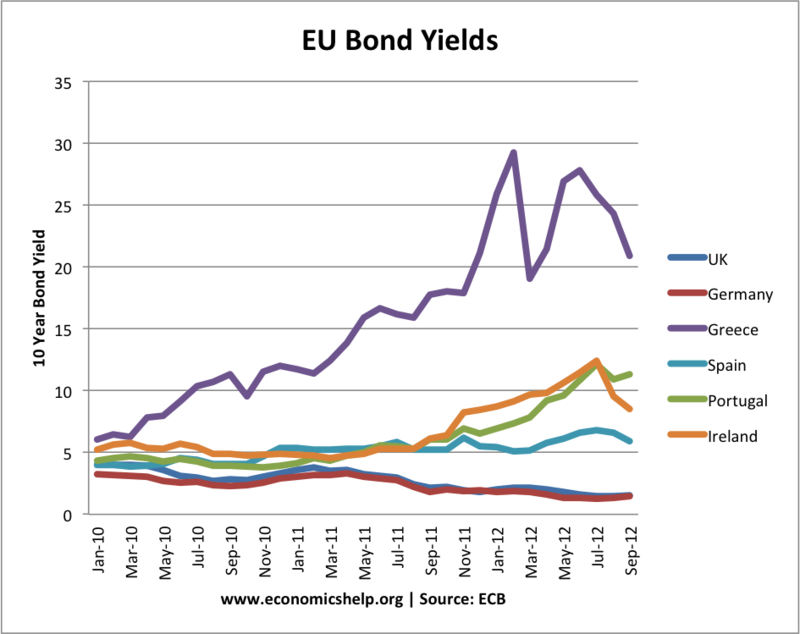 For example, suppose a country in the Eurozone has debt to GDP ratio of around 60%. With positive economic growth, this kind of debt should be manageable; they should be able to pay it off. However, if there was a fall in confidence in bond markets, one month the country may be unable to sell sufficient bonds. The country might have some illiquid assets (e.g. islands, national treasures it could sell) but the problem is that in the short term, it can’t gain sufficient finance to meet its current expenditure. Therefore, it is experiencing liquidity issues. In 2012, there was a crisis of confidence in the Eurozone. It started with evidence Greece was insolvent. Investors no longer wanted to hold Greek bonds and so the yield on bonds rose rapidly – getting close to 30% – indicating it was seen as ‘junk bond’ with little hope of getting money back. Because of uncertainties over Greece and recession in rest of Eurozone investors became nervous of holding debt in other Eurozone economies, such as Ireland, Portugal and Spain. These countries were not insolvent, but they had no Central Bank to print money and buy bonds. A country like the UK can easily avoid liquidity issues by having a Central Bank who is willing to print money and buy bonds where necessary. This means that if the UK sold insufficient bonds one month, the Central Bank could intervene to provide liquidity. A Central Bank can help avoid temporary liquidity shortages, but it wouldn’t be a solution if debt levels were fundamentally unsustainable and the country was insolvent. Higher interest payments making it harder to repay actual debt. It also forces governments into austerity measures which lead to lower growth and can make it very difficult to achieve a positive rate of growth and repay the debt in the long-term. Therefore access to liquidity can help, but it can’t solve a fundamental situation of insolvency. Can you explain why a currency-issuing government like the UK ever *needs* to borrow in the currency it issues? Again, for the UK, where do the pounds Sterling it borrows come from in the first place?